In the aftermath of Dolores O’Riordan’s death, the last person to speak to her has revealed her final message, shared the night before her body was found. The 46-year-old musician was found dead in a hotel room yesterday at the Hilton’s Park Lane Hotel at 9.05am. Her death is being treated as ‘unexplained‘, and has been confirmed by the Met police. It has now emerged O’Riordan had appeared ‘full of life’ in the lead up to her untimely death in a voicemail she left just after midnight for a music producer. Dolores was in London for a short studio recording session with the band Bad Wolves, who she was planning to collaborate with on a new version of The Cranberries’ hit Zombie. Dan Waite, international managing director of record company Eleven Seven Music, had been working with Bad Wolves on their new album and received the voicemail message from Dolores just after midnight. The news that my friend Dolores has passed deeply shocked me. I worked with the Cranberries at Universal Records and have kept in touch ever since. Dolores left me a voice message just after midnight last night stating how much she loved Bad Wolves’ version of Zombie. She was looking forward to seeing me in the studio and recording vocals. She sounded full of life, was joking and excited to see me and my wife this week. The news of her passing is devastating and my thoughts are with Don, her ex-husband, her children and her mother. 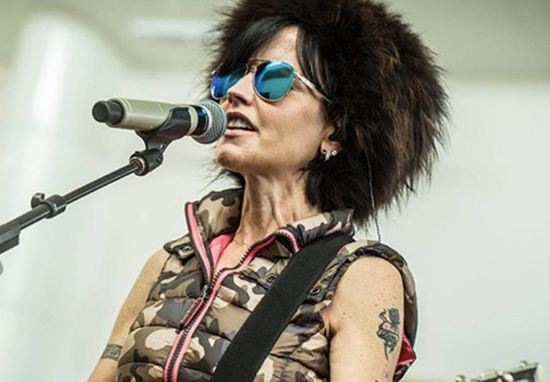 Dolores was born and raised in the Ballybricken area of County Limerick, Ireland – in 1990 she auditioned for the role of lead singer for a band called The Cranberry Saw Us which eventually became The Cranberries. Prior to their 2003 hiatus, the band released five albums: Everybody Else Is Doing It, So Why Can’t We? (1993), No Need To Argue (1994), To the Faithful Departed (1996), Bury the Hatchet (1999) and Wake and Smell the Coffee (2001). We are shocked and saddened at the news of Dolores’s passing, mere hours before she was to record vocals on our upcoming version of Zombie. We have always had deep respect for her as an artist and a vocalist and she was never afraid to bare her soul in her music and lyrics. Zombie is an incredibly personal song and although we are a hard rock band, we always felt the rawness and honesty she projected on stage and in her recordings was something to which all bands should aspire to, regardless of genre. When we heard she liked our version and wanted to sing on it, it was the greatest compliment a new band, or any band for that matter, could have received. Our hearts are broken that we were not able to see this collaboration through and our deepest condolences go out to her family, friends, loved ones and fans in Ireland and around the globe. We hope we can still make her proud by sharing our version of Zombie with the world. The lead singer with the Irish band The Cranberries was in London for a short recording session. No further details are available at this time. Meanwhile, fans of The Cranberries and their unwavering years of influence over the music industry change their default setting to mourning.